The DIY (that's Do It Yourself) approach to filmmaking has been around since the beginning, as there have always been enterprising filmmakers who circumvented any official system and simply made a movie on their own. With the advent of home video and now, digital video, more creative folks then ever are getting out there and creating their own cinematic magic. With this approach, it's not unusual to find someone involved who is a "Jack of all trades". The New Zealand film When Night Falls is no exception, as Alex Galvin served as writer, director, producer, and under a pseudonym, editor. Oh, and he also has a cameo in the movie. However, Alex took this DIY attitude a step further. When it comes to getting movies for this site, I am usually contacted by a studio representative, or in some cases, I contact them. But, in the case of When Night Falls it was Alex himself who tracked me down and asked if I would like to review the movie. He's halfway around the world, and he's acting as his own street team! Clearly, he believes in the project. When Night Falls takes place in 1932 in a remote area of New Zealand. (Isn't "remote area of New Zealand" redundant?) The area has been terrorized by someone who is killing nurses from the local hospital. Louise (Tania Nolan) works as a private nurse, where she cares for David Andrews (Kevin Keys) in his home. She works alongside another nurse, Martha (Rosella Hart), who has just recently joined the staff. Due to a leaky oxygen cylinder, the caretaker (?) Mr. Jacobs (Gerald Bryan) has gone to the nearest town, and won't be back until morning. The attending physician, Dr. Thomsen (Alex Galvin), has gone to make housecalls. Therefore, Louise, Martha, David, and the cook/housekeeper Mrs. Jacobs (Sylvia Rands) are left alone for the night. As one would expect, Louise and Martha are both spooked by the fact that a man who kills nurses may be loose in the countryside. As the night wears on, they try to keep their minds off of this, but Mrs. Jacobs gets drunk and passes out, and they begin to hear strange noises throughout the house. Is it simply their imagination or is someone really there? When Night Falls has all of the quintessential trappings of a low-budget horror film and Galvin basically admits this on the accompanying commentary. We have only a few characters; a simple location (although, this is technically incorrect, as eleven locations were used to create the one house); the story takes place in a short period of time; and the premise is fairly simple and easy to grasp. The movie contains one action scene and is relatively gore free -- in fact, there are really no overt special effects. However, calling the movie "simple" would be a mistake. By taking a Spartan approach to the overall structure of the film, Galvin is able to be meticulous in other ways. The first thing that caught my eye was the camerawork. Galvin avoids any Raimi-esque "Hey Mom, look at me!" camera moves, and goes for a more classic look. You don't see many low-budget movies, never mind feature debuts, where the director has so many shots with one actor prominently placed in the foreground and one in the background. There was also a tracking shot of Louise's feet going up the stairs which worked quite nicely. And Galvin proves that he's either crazy or stupid by placing a huge mirror in one of the key sets! As with the shots, the script clearly pays attention to detail as well. I won't go as far as to say that the movie is dialogue-heavy, but it's rare to see a movie in this genre with this much talking. This adds to the movie though, as it allows us to get to know the characters. The movie also allows the specific details of the story to unfold in an organic way. For example, it's quite some time before we learn what is wrong with David. But, this pacing also hurts the movie, and reveals itself to be the film's one major flaw. While it's admirable that Galvin allows us time to get to know the characters, the movie gets bogged down at times. Clearly, Galvin wants Louise's trepidations to spread out to the audience, but there's only so much of someone wandering a house that we can take before our minds begin to wander. As one would hope, things do pick up in the final reel and the twist-ending is somewhat surprising. However, it's easy to feel cheated that we waited through so much hand-wringing and talking for just a brief release of violence. While When Night Falls is far from perfect, it's certainly a promising debut. Galvin proves that he's got a good eye and his attempts at ramping up the tension are admirable. Even those who don't like the movie should appreciate the fact that Galvin clearly knows the genre, and he'll win over some when a character thinks about the finale and says, "That doesn't make any sense." How is that for knowing your audience? 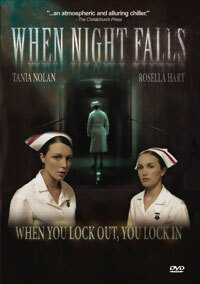 When Night Falls refuses to answer the door on DVD courtesy of E1 Entertainment (and Alex Galvin). The film has been letterboxed at 1.78:1 and the transfer is enhanced for 16 x 9 TVs. The movie was shot on HD and therefore it shows no overt grain and no defects from the source materials. The colors look fantastic here -- just look at how green that pool table is! But, the transfer of the HD source has created some problems. Many light-sources look "blown out" and it's not unusual for the backgrounds of scenes to have pixellation. Some shots look like Eddy Grant's "Electric Avenue" video, but I don't think that they were supposed to. The DVD carries a digital stereo audio track which provides clear dialogue and sound effects. While we would have preferred a 5.1 track, especially given the film's story, this track is satisfactory. The dialogue is always audible and the music rarely overpowers it. The stereo effects are good, and they often work at demonstrating that a character heard a noise off-screen. The When Night Falls DVD contains a few extras. We begin with an AUDIO COMMENTARY from Writer/Director/Producer Alex Galvin. This is a very nice chat, and Galvin is able to speak at length throughout the film. He gives us detailed information about the making of the movie, providing frank tidbits on overcoming a low budget. The DVD offers two "Image Galleries" -- one with "Behind the Scenes" pictures and the other with "Production Stills". The final extra is a text file of "Director's Notes", where Galvin discusses his career and what lead to making When Night Falls.